Are you looking for a Washroom Checklist? Download this washroom checklist template now! In order to rapidly manifest your cleanliness needs in the washrooms, you need to get a professional schedule that keeps track on the washroom activities on a daily basis. 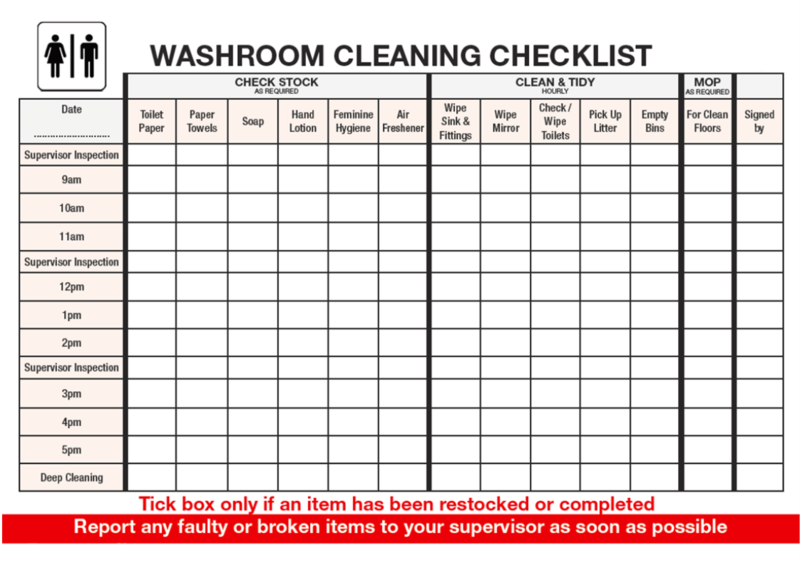 This easy to washroom cleaning checklist will help you to manage your cleaning staff. The checklist clearly shows what needs to be cleaned and when. It includes clear supervisor inspection moments to show a sense of authority. Personnel needs to sign off each row and state what item has been cleaned or has been stocked. This Washroom cleaning checklist template will help you structure these activities in a professional way. If you are looking for an Excel Cleaning Schedule for the Washroom, check out this template: Washroom Cleaning Schedule Excel. Download this professional business template now! Using our business templates guarantees you will save time, cost and efforts and helps you to reach the next level of success in your education, work and business! Guest: this Washroom Checklist is really useful!